Elijah List Challenge ‘Culprit in the Pulpit’ REVEALED! Home › Australian Prophetic Council › Elijah List Challenge ‘Culprit in the Pulpit’ REVEALED! We’ve had a number of guesses submitted to the GUESS WHO? ELIJAH LIST CHALLENGE: The Culprit in the Pulpit and we have a winner! The Culprit in the Pulpit attended the Australian Prophetic Summit. This conference was held between the 5th and the 7th November 2015 at Glory City Church, 46 Kelvin Grove, 4059, Brisbane, Qld, Australia. The key speakers were Steve Schultz (founder of the Elijah List), Katherine Ruonala, Faylene Sparkes, Gary Morgan, Fini and Isi de Gersigny, Amanda Wells and Lana Vawser. We asked many people to promote and contact candidates on the Elijah List about the Elijah List List Guess Who Challenge: ‘Pulpit in the Culprit’ game. We believe Lana Vawser was contacted early on about the “Culprit in the Pulpit”. After a small dialogue exchange she never got back to us on her thoughts regarding a plagiarizing prophet among their own ranks. Clearly she has no care for frauds disguising themselves as prophets. We also contacted Katherine Ruonala who the Culprit in the Pulpit was. She was the one that ran the Australian Prophetic Summit. We then contacted the head of the Elijah List who was speaking at this conference, Steve Schultz. We told him who the Culprit in the Pulpit was. We heard no word from Mr Schultz. It appears that no one seems to care that they were speaking with a Prophetic Fraud. Not even the Elijah List’s president. SO WHO IS THE CULPRIT IN THE PULPIT? Like we said in the clues, we informed the Culprit in the Pulpit that they were the Culprit in the Pulpit so they could repent before they spoke at the Australian Prophetic Plummet. All we now know is that on November 6th the Summit had “technical difficulties” and could not livestream the event. Congratulations AMANDA WELLS! YOU are the CULPRIT IN THE PULPIT! We have informed most of the other “prophets” on the Elijah List that Amanda Wells have plagiarised their work and countless others. We have been and will continue to be informing all the individuals that Wells has either profited from their material or has used it to promote her own “Prophetic”, “Master Class” or “Business Coach” seminars/schools. This is a brand new website that has started up to expose all the lies, sins and theft of Amanda Wells. 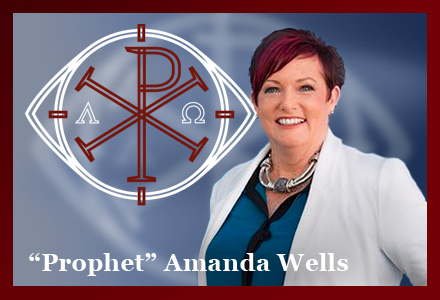 From what we have seen, Amanda Wells has reinvented her past and plagiarised over 30 other works to further her own prophetic/financial ministry/business. The website that has documented Amanda Wells’ sin is called Weeding Out Wells. Browse the pages or articles to read about the works she has plagiarised and the lies she has concocted. A website exposing the sins of Elijah List, false prophet Amanda Wells. Here are just SOME of the articles exposing Amanda Wells’ written plagiarism. Written Plagiarism – Exhibit 02: Lacking emotional intelligence? Written Plagiarism – Exhibit 04: Amanda Wells’ “30 years” worth of speaking tips? And here are just SOME of the articles exposing Amanda Wells’ video plagiarism. Oral Plagiarism – Exhibit 01: Do Mentally Strong People Have to Plagiarise? Oral Plagiarism – Exhibit 05: Wells teaches from experience how to write books? According to the New Apostolic Reformation (which is what the Elijah List is apart of), we are nothing but ‘heresy hunters’, ‘critics’, ‘Pharisees’ and ‘spiritually dead’ because we DARE to challenge the whole lot of the Network of prophets. Yet not ONE “governing” New Apostolic Reformation or Elijah List “Prophet” or “Apostle” could discern and/or even see who the fraud is in their own network. In fact, some of these “Apostles” and “Prophets” didn’t even care. Some would even justify that their “god” was bigger than this ‘issue’. But what kind of “Apostle” or “Prophet” would do that? These “prophets” and “apostles” had months to “prophetically” and “apostolically” deal with this issue. There was no word from Rick Joyner, Bill Johnson, Chuck Pierce, Todd Bentley, Bill Hamon, Cindy Jacobs, Katherine Ruonala and so on. Their attitude and silence reveals how flippant they are about God, His Word and His standards of holiness. They are quite prepared to throw out the bible when it suits them but use the bible (sheep clothing ) to further themselves. We will expect them to throw their typical insults and justify their sins but not repent of their false ministries. Face it. It’s better someone be labeled a ‘heresy hunter’ by these frauds instead of Jesus Christ calling someone a “lawless one” and be thrown into the abyss prepared for Satan and his angels. ‹ Chris Rosebrough reviews Christian McCudden’s sermon, “Miraculous Encounter”. Reading between the lines of the ‘prophecy’ I detected pure Latter Rain doctrine, which is the root of all things in the modern NAR version. Things like “Joel’s Army” and a clear pointer to the “Manifest Sons of God” teaching too. I’m just sitting here, wondering who ‘coreographed’ the ‘prophecy’ for poor old Merrilyn Billing??? I don’t want to promote these inane “prophecies, but I believe it is important to understand why these ‘words’ could never come from God – simply by reading some of them! That lana vawser ‘word’ is a total joke. What a crock! These ‘prophets’ are such liars. The Elijah List Store looks more like a business marketing venture than a group of true prophets. Does anyone know if this Steve Schultz receives some kind of % or salary off all these sales?